The key to losing weight is to take in fewer calories than your body burns, which is often easier said than done. Choosing a diet full of nutrient-dense foods will help you feel satisfied, making it possible to keep your calorie intake low. 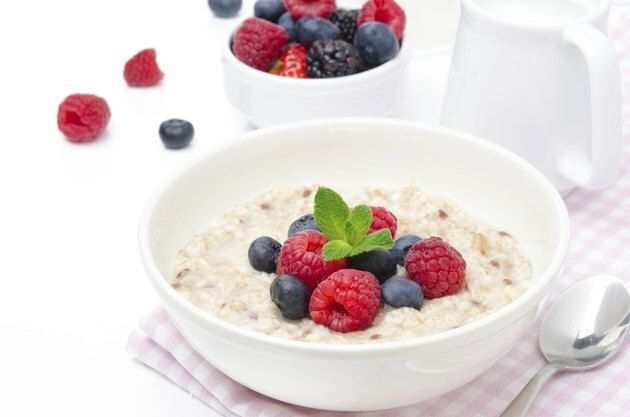 Oatmeal and yogurt are two foods that have been shown to increase satiety and boost weight loss while dieting, and as part of a healthy meal plan, they may help you lose five pounds over time. According to the Calorie Control Council, you must burn 3,500 more calories than you consume to lose a pound. Creating a daily 500-calorie deficit should result in a 5-pound weight loss in approximately five weeks. A meal of 1 cup of oatmeal and 5 ounces of plain, low fat Greek yogurt with 1/2-cup sliced berries weighs in at around 350 calories. The meal also provides 20 grams of protein, 39 grams of carbohydrate, 5.5 grams of fiber, and 6 grams of fat. Two meals of oatmeal and yogurt, one 100-calorie snack, and a healthy 500-calorie dinner will add up to a 1,300 calorie meal plan. Most people can lose weight on a 1,300-calorie plan. Depending on activity level, men may need to add 200 to 300 more calories by consuming a larger dinner or higher calorie snacks. Yogurt is an excellent source of calcium and protein, two nutrients that have been proven to raise the body's metabolic rate and boost fat loss. A 2004 study published in Obesity Research found that individuals consuming a calorie-restricted diet high in dairy products lost 70 percent more weight than those limiting calories only. Another study published in the International Journal of Obesity in 2005 found that including yogurt in a low-calorie diet significantly increases fat loss, specifically in the trunk region. To avoid excess calories, flavor your plain low-fat yogurt with a drizzle of honey, a sprinkling of cinnamon or choose a yogurt with a calorie-free natural sweetener, such as stevia. Greek yogurt provides even more protein than traditional yogurt, and less natural sugar. Oatmeal is an excellent weight loss food because of its fiber content. The insoluble fiber contained in oatmeal slows digestion and helps you feel full for longer, and the cholesterol-lowering soluble fiber may help burn belly fat. Researchers at Wake Forest Baptist Medical Center found that diets higher in soluble fiber were associated significantly with lower accumulation of belly fat over time. Choose old-fashioned oats or quick oats rather than packaged instant oatmeal, which has added salt and sugar. Sweeten your oatmeal with a drizzle of maple syrup or honey and top it with fresh fruit. Oatmeal and yogurt should keep you satisfied throughout the day, but don't ruin your plan by overindulging at dinner. Choose a sensible dinner consisting of a lean protein source, several servings of non-starchy veggies, and a small serving of a starch or whole grain. For example, a 4-ounce grilled chicken breast with 1 cup of steamed broccoli, a small baked sweet potato and a lettuce salad or a 5-ounce grilled salmon fillet served with 1 cup of roasted asparagus and 2/3-cup brown rice are healthy dinners that will keep your weight loss on track. Aim for a 500- to 700-calorie dinner, depending on your activity level.